Come out from underneath your doona, rip off that woolly jacket! 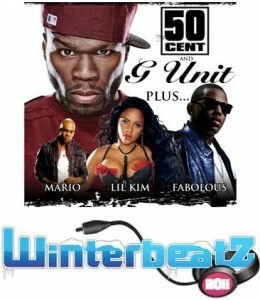 ‘Cause Winterbeatz is back to heat up the cooler months with some of the hottest urban/r&b acts on the planet. Just like its sister festival Summerbeatz, Winterbeatz brings to Australia some of the world’s biggest names for a whirwind visit to Australia’s four biggest cities. Headlining this year’s event is rapper 50 Cent – who’ll bring along G-Unit (Lloyd Banks & Tony Yayo). He’ll be joined on the four dates by New York raised rapper Fabolous, Grammy Award-winning rapper Lil’ Kim and R&B singer Mario. The tour kicks off at Perth’s Challenge Stadium on Wednesday August 17, with dates following in Melbourne, Sydney and Brisbane. Tickets for the Melbourne date are on sale at 9am on Thursday, with Sydney, Brisbane and Perth hitting the sales desk at 9am on Friday.